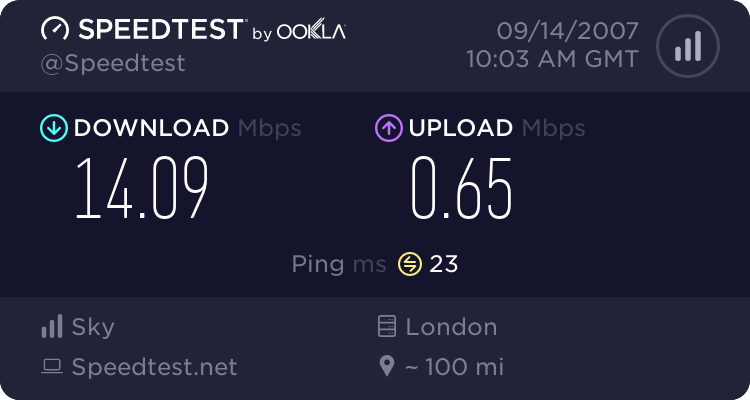 Your SNR and ATT look fine, if you're getting actual download speeds that match your sync speed (8Mb) then this is fine. What Sky need to do is stop looking at what BT *estimate/think* you should get, and set the line for what you CAN get. Sky need to remove your G-DMT/8Mb cap. Ya thanks on my second phone support for tier 3 first time they just said I needed a new sky router which was rubbish as they both proform the same.This time I will try get the G-DMT/8Mb cap removed and not get put off as I was getting 18mb dl speed with my old ISP.So I can't see no reason why I can't get the 16mb with sky. Last edited by totalwar; 12-09-07 at 04:15 PM. Ok at last it's sorted I had a crossed line on the port so there was two mac address connected to the same port.sky contacted BT and now all sorted.Getting full 16mb dl speed. Last edited by totalwar; 14-09-07 at 11:04 AM.